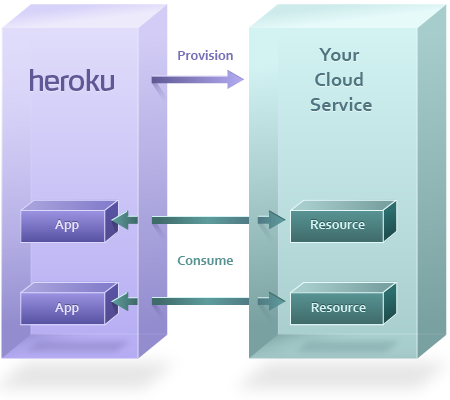 Heroku customers use the marketplace or the Heroku CLI to provision your add-on. When this happens, Heroku sends a request to your service, which creates a new private resource for the app. This resource represents your service, and is what the client application will interact with. The URI representing the resource is made available to the app as a config var. The app can then consume its private resource via a library, plugin, or over HTTP, depending on your service. The make-up of the provisioned resource(s) depends on the type of service you’re operating. In almost every case, you will want to provision a user account. However, a database add-on partner may choose to also immediately create a database that the app can start using, whereas exception reporting service may issue an API key in addition to the user credentials. Once the resource is created, your service will respond with a URL with the exact location and credentials that the app can use to access their private resource. Heroku adds the returned URL as a config var in the app, rebuilds the slug and restarts all dynos. The user’s app is now ready to consume the resource your cloud service has provisioned for them. The app may wish to consume the resource when an end user makes a request to the app from their web browser. Or, a worker dyno in the app may need to consume the resource as part of performing a background job. For example, a page might wish to consume a database resource by sending a query like “SELECT * FROM table”, or consume a web service with a call like POST /exceptions. The app uses a URL, which was stored as a config var in the app during provisioning, to access the remote resource. Datastore resources such as MySQL, MongoDB, or Memcache have their own protocol and will use a client library such as ActiveRecord, MongoMapper, or MemcacheClient to access the resource. These resources will have URLs that start with protocol names like mysql://, mongo://, or memcache://. Web service resources such as Exceptional or New Relic use HTTP as their protocol, so their URLs will begin with https://. If it’s a read request (such as SQL’s SELECT or HTTP’s GET) it will look up the information to return to the app. If it’s a write request (such as SQL’s INSERT or HTTP’s POST) it will store that information to the resource and return an acknowledgment. Once the app has its response, it can use this to build a page for the end user (if this consume request came from a dyno processing a web request), or to continue processing its background job (if this consume request came from a worker). Add-ons can only read the config vars they set on an app, and they can set zero, one, or many config vars. They cannot read config vars you manually set on your app nor those that other add-ons set. By providing us with your manifest, you will have described your add-on to our system in such a way that we can integrate it into our Marketplace as well as the Dashboard. The Dashboard is where customers manage the resources associated with their app. A Heroku customer can log into the Heroku Dashboard to view information about their app. Clicking an app will take you to an in-depth page about on the app, which also shows all the installed add-ons. The customer finds your add-on in the list and clicks on it. Heroku generates a single sign-on token using the ID of the resource, the current time, and the salt (a shared secret known to both Heroku and your service). The add-on partner’s site receives this request, confirms that the token matches, and confirms that the timestamp is fresh. The site can set a cookie in the user’s browser to indicate that they are authenticated, and then redirect to the admin panel for the resource. You can log users into your site quickly with SSO URLs. The link can be placed in email or Campfire notifications, and when the user clicks them they can proceed directly to your add-on dashboard.